These outdoor decor finds are all super-lightweight and completely portable, so taking them outside is a piece of cake. 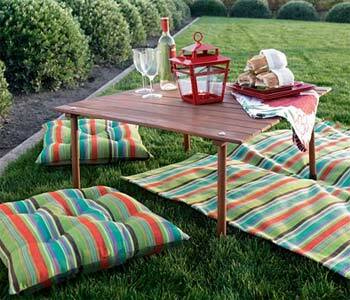 When the weather’s nice, you want to spend as much time as possible outdoors: eating, drinking, playing. The only problem? Most of the stuff you use to eat, drink and play normally resides indoors—and hauling it all outside can be a pain. That’s where these finds come in: They’re all super-lightweight and completely portable, so taking them from the front porch to the back porch to the gazebo to the dock is a piece of cake. Which means you can spend less time worrying about how you’re going to create the perfect outdoor-living environment, and spend more time...well, actually living in it. I know, I know—you can’t possibly imagine grilling on anything other than the six-burner, stainless-steel, gas-powered beauty on your deck. But what about those times when you want to enjoy a simple supper, say, down by the lake? That deck-bound monstrosity certainly isn’t coming with you. What Pottery Barn’s portable grill lacks in frills, it makes up for in convenience: It’s lightweight, with convenient handles and fold-away feet. And its charming galvanized-bucket style will instantly transport you back to a time when you couldn’t imagine anything better than an impromptu supper created from that day’s catch.$39 Call 888-779-5176, or click here. When it comes to staging the perfect picnic, we often get so caught up in the magic of the idea that we forget about the pitfalls—like uneven ground that inevitably causes a spill, or that colony of ants marching across your blanket in search of the egg salad. 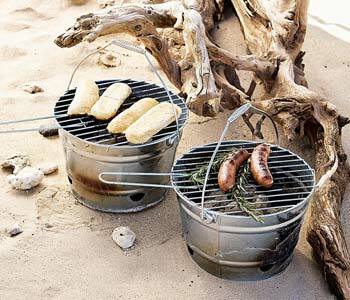 How to escape these common picnic problems without losing the spontaneity that makes the whole enterprise so charming? I’m a fan of Crate & Barrel’s Table in a Bag, a foldable table that’s easy to assemble and even easier to tote. The sturdy, rubber-capped feet will keep everything in its place—plus, the hardwood table will add a note of sophistication to your afternoon outing. $39.95 Call 800-967-6996, or click here. 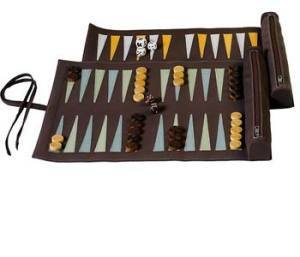 There’s nothing like capping off a leisurely alfresco supper with a board game that lasts until the wee hours of the night—but if you’re concerned about the unpredictable whims of the weather or the risk of losing gamepieces, Restoration Hardware’s roll-up backgammon, chess and checker games have got you covered. Each one features a board made of durable, waterproof vinyl, which rolls up around a zippered case fashioned to hold all of the magnetic wooden pieces. Let the games begin! $39 Call 800-819-0969, or click here.